Good! This is taken from the last version used in ROT66, right? The mode configurations appear slightly adjusted. Will this modified NarsilM become available for download? Oh boy, might have to buy one or two of these just to see what’s going on… Been debating spending the money. If anyone should receive one for free, it’s you. Mostly I just want to make sure people understand and follow the license, which requires publishing the code used in the product. I wouldn’t complain about a free light, and if I had one I’d probably port other code to run on it, but my main concern is that everything stays open. Hhmm. haven’t heard of issues storing settings, but, anything is possible – there is wear leveling logic – think the “block” of settings is up to about 4 bytes now. I’m thinking it is saving, or attempting to save every time, just that something went wrong there with the addressing or something. Could be failing to load the setting,s then using defaults when this problem occurs. If I understand correctly, it only forgets when the batteries are removed… and it doesn’t always happen. Ohh, thanx! I'll check it out. The size comparison is really useful. Definitely a bit more pocketable than the Q8, though I can see why it heats up faster on turbo. I’m always surprised by how chunky the M43 is. Thanks Charles Lin! You post some of the best comparisons I’ve seen! I’m surprised the MF01 looks so much brighter than the Fireflies XPL-HI version. The MF01 219C makes about 7k real lumens. Whereas the XP-L hi ROT66 is supposed to make 10k lumens. Do you have a TA lumen sphere to compare the two? Thanks for the pics Charles, very helpful. Noticed you have the MF01 beamshot in the gif but not standalone. Any chance you could edit that one in there? It does look quite bright but honestly the floody LEDs really show off at this short distance. 7k vs 10k lumens is not much difference really and especially since the HI is more focused it’s probably just the extra 3k all in the middle where it’s already too bright in the middle for the camera. 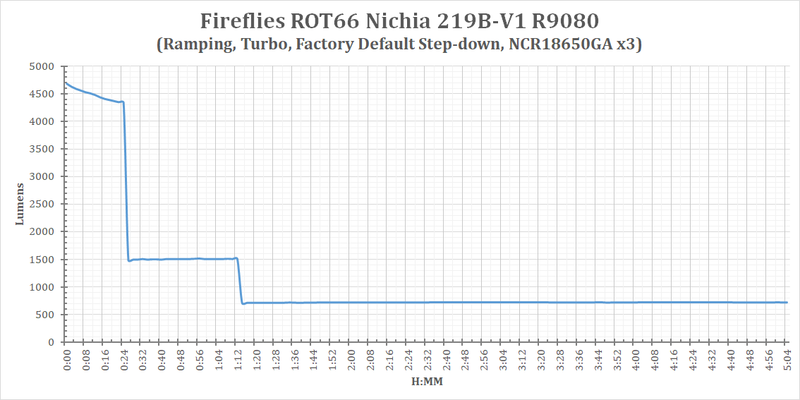 So if you had to only choose one ROT66, would you go with the XPL HI or the Nichia? The Q8 is a wonderful light for the money and demonstrates its better reach in that picture quite well. Very nice! What do you think of the champagne color? I could see myself loving it or hating it, but can’t decide from the pictures. My MF01 is running Lexel FET driver with NarsilM v1.2, it should output around 9000~10000 lm. The best output munber I can get from ROT66 XP-L hi is 7480lm 0 second & 6650lm30 seconds with VTC5A. I personally prefer Nichia. very nice tint & it is only stock high output light use Nichia 219b R0908 as far I know. XPL HI runs very hot in turbo mode for only about 30~40 seconds. It is personal preference. I like the champagne color because it stand out against all the other dark color lights. My MF01 is running Lexel FET driver with NarsilM v1.2, it should output around 9000~10000 lm. The best output munber I can get from ROT66 XP-L hi is 7480lm 0 second & 6650lm30 seconds with VTC5A. Does this concur with the the notes I quoted from the Q8 (FET+1)? I can’t really tell. That first step down looks a bit larger than 100% to 55%. Maybe more like 100% to 35%? Does that seem correct? Sorry, all that code looks Greek to me. Lol. So does it look like the ROT66 is using their own tweaked version of NarsilM v1.2? Level 1 is set to 100% of channel 1. Level 2 is set to 100% of channel 1 and 2. Level 3 is set to 100% of channel 1, 2 and 50% of the FET. Level 4 is set to 100% of channel 1, 2 and the FET. This kind of makes sense to me. I hope it’s correct. I believe the spacing in brightness levels will vary between the 219C and the xpl due to the Nichia version using 7 × 7135 and the Cree version using 14 × 7135. Is this correct? Do you know how to set your own temperature limit? Here is a link to a video I made showing how to do it. Make sure to start with a room temp light inside and out. I’m sorta glad that the 700ish lumen mode will probably be the one I use most, because it will be less rosy compared to the max. 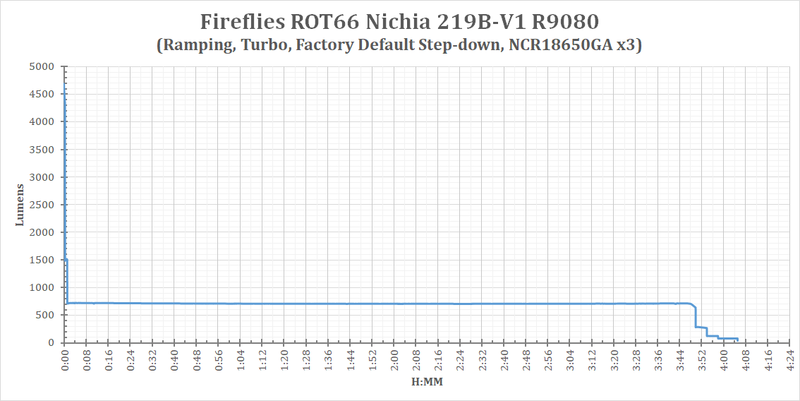 Those 9080 nichias driven to their limit are pretty damn pink. Although I might think differently once I get mine. The driver and configurations on ROT66 (FET+1+6, 3 channels) is different from Q8 (FET+1, 2 channels), so sometimes you cannot simply apply what you observed from Q8 to ROT66. The thermal step-down in ramping in original NarsilM periodically checks if the temperature limit is exceeded, and if yes, it will reduce 1/6 = ~16.7% of the current output level (output levels are not guaranteed to be linear though). And the lower bound of this step-down is the max of the 7135s, i.e., on ROT66 it is (1 + 6) = 7 × 7135. That’s why I said “step-down to the highest regulated brightness level”. The default mode-sets defined in the code Lexel posted are slightly different from the original NarsilM v1.2, so they did tweak something, and I wish they could release that modified version (they should, for license compliance). Level one is set to 100% of channel 1. Level 2 is set to 100% of level 1 and 2. Level 3 is set to 100% of level 1, 2 and 50% of the FET. Level 4 is set to 100% of level 1, 2 and the FET. 255 means 100% output of a channel. 25 means 25/255 = ~10% output of that channel. Hope this is much clearer. Sorry, I have no idea how many 7135s are used in the XP-L HI ROT66. The Nichia version is using 7 and the Cree version is using 14 according to Lexel. Okay so I think I’m getting it. Level 1 is set to 10% of channel 1. Level 2 is set to 100% of channel 1. Level 3 is set to 100% of channel 1 and channel 2. Level 4 is set to 100% of the FET (channel 3). Doesn’t the highest level in other versions of NarsilM add the 7135 channels to the FET? In this version it turns them off and uses only the FET? Doesn’t the highest level in other versions of NarsilM add the 7135 channels to the FET? When all 3 channels are at 100%, the output is actually a bit lower than the FET by itself. So for the very highest level, most lights run FET-only. The 7135 chips would only drag it down. I wish they could release that modified version (they should, for license compliance). Tom and I got a copy of the code today. It’ll be up soon. Okay, I must be remembering it wrong. Thanks. Here’s the output behavior on a scope. Gif from low to max FET. Horizontal lines are 100% 1×7135 and (1+6)x7135. The latter is almost impossible to activate on ramp mode so had to swap to mode config for that, but the 1×7135 I managed to do a couple of times. Interesting. 7 × 7135 on the Nichia is right on the spot, the max temperature is ~43C in my runtime test. Curious about the brightness and stabilized temperature when 14 × 7135 are installed for the Cree version.